Spurred on by activist mom Maartje Rutten and friends, a campaign to take back Amsterdam’s streets that began with festive, peaceful protests turned more serious when a bike-riding child was killed. With auto traffic banned on Sundays because of a fuel shortage, a dramatic mass ride through a cars-only tunnel seemed to turn the tide. New regulations including special bike lanes, traffic-calming constructions, and new right-of-way laws changed things in Amsterdam and all over the world. 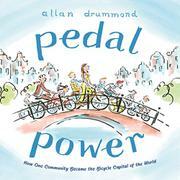 The author surrounds this simply told story with endpapers showing bicycle efficiency, bicycle contributions to social progress, great cyclists, and great bikes of the world. He includes statistics about bike-share programs and reasons for using bicycles to get around. As he did in other tales of community transformation, he decorates his text with cheerful pen-and-ink sketches with watercolor wash. Appropriately for the Netherlands, most of the people shown are white; Drummond correctly includes racially diverse cyclists and also provides a 1970s photograph in the author’s note showing a smiling rider of African descent. The note recalls his original goal: showing “how wonderful it feels to ride a bike, particularly in a city.” That joy is evident throughout; it might even convince some readers to give it a try.